For Carl Rettenmeyer ’53, an early interest in insects evolved into a fascinating career. An army ant major rears up in alarm. During his life, Carl Rettenmeyer has made the acquaintance of various large and dangerous beasts. He’s faced off with a fer-de-lance pit viper and stared down a puma in Panama, gone toe-to-toe with a tapir and nose-to-nose with an ocelot in Ecuador. Yet, although he shivers with a certain exquisite terror mingled with delighted awe in the presence of large animals or deadly reptiles, these encounters were never planned. All occurred in the rain forests of Central and South America during his five-decade–long pursuit of a creature actually no more than a half-inch long—the army ant. 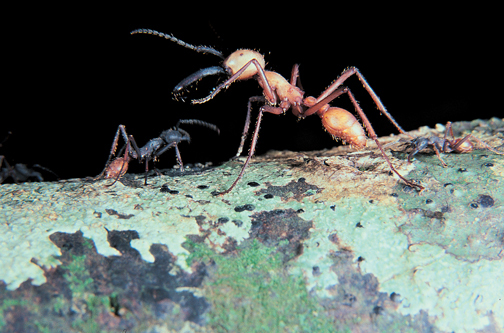 Despite their reputation as ferocious killers—largely the result of science-fiction, says Rettenmeyer—army ants are beneficial to the environment and to human beings. “Well, they do bite but cause no serious damage,” he adds. There are about 155 species of army ants in the Western Hemisphere and a possible 100 more in Asia and Africa. Rettenmeyer is particularly well-informed about the species Eciton burchellii, found in Central and Southern America. Rettenmeyer explains that the army-ant caste system consists of one queen, winged males, and workers. The ants, which are blind and depend on chemical trails for direction, are migratory, moving in columns—about 100 feet long—of up to one million ants. He’s calculated the size of migrating colonies by carefully timing and filming their movement between two points, then watching the film in slow motion and counting the ants. As they migrate, the ants transport larvae, cocoons, and food for the colony. The queen remains in the middle of the column, protected by workers swarming on top of and around her. The colony moves by night from one nest—or bivouac—to the next, distances of up to 100 yards at a speed of about 20 yards per hour. Army ant migrations occur every night over two-week periods, according to a schedule that is related to the queen’s reproductive cycle. After a queen lays eggs—sometimes more than 200,000 in 10 days—the colony stays put until larvae emerge, followed by a further series of migrations until the larvae mature and spin cocoons. A typical colony travels about nine miles annually, building its bivouacs among tree roots or inside hollow trunks. With the ability to support 100 times their own weight, the ants often form living bridges from nest to ground, linking their bodies by means of hooks on their legs. The workers hunt for food in swarms, usually starting at dawn, Rettenmeyer says. “A swarm raid can be about 50 yards wide. It’s quite an intimidating sight. Once you see it, you never forget it.” Ant prey includes cockroaches, wasps, katydids, crickets, scorpions, other ant species, and, on rare occasions, a small vertebrate such as a lizard. The ants dismember larger prey and transport it back to the bivouac. Their mandibles are so strong, he says, that native peoples have been known to use them as natural sutures, pinching off the ant’s thorax and abdomen, leaving the head and jaws to hold a wound closed. Swarm raids are accompanied by flocks of ant birds that hover near the swarm not to attack the ants but rather to devour the arthropods they flush out during their marauding. “Forty-six species of ant birds depend on Eciton burchellii alone for food,” Rettenmeyer says. Above: With the ability to support 100 times their own weight, the ants often form living bridges from nest to ground, linking their bodies by means of hooks on their legs. “Army ants are the most important predators in a tropical forest,” he adds, “because a single colony can consume half a million animals a week. They’re a kind of biological pest control.” He knows of army ant raids that have passed through houses without stopping, and when they leave, the building is emptied of household pests. 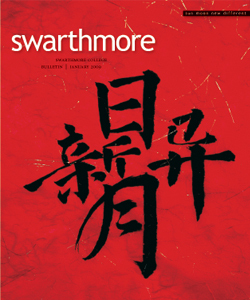 Now 77 years old, Rettenmeyer says he has had a serious interest in “bugs” since childhood, but his fascination with army ants really began when he was at Swarthmore. During his junior year, he found himself in a biology course with a group of students who were all premed except for him. “I was the weirdo from day one. The other biology majors joked about me wanting to study bugs,” he says. Soon, Rettenmeyer was off to Panama for six months. “I think Schneirla picked me because I was a member of the varsity cross-country team and he thought if I could run six miles, I’d be able to do the work in Panama,” Rettenmeyer jokes. Graduating with a B.A. in biology in 1953, Rettenmeyer embarked on a Ph.D. in entomology at the University of Kansas. However, when he received a call from Life magazine, inviting him to return to Panama for nine weeks with a photographer who was shooting a feature on army ants, Rettenmeyer couldn’t refuse. Life paid for the trip and provided a small stipend. “That was my lucky break,” Rettenmeyer says. “We collected thousands of specimens,” including 147 species of mites that live on various parts of the ants’ bodies. He explains that hundreds of thousands of insects—including species of microscopic flies, beetles, and silverfish—live among the army ant colonies. Hidden in the swarm, they enjoy a degree of protection because their natural predators are themselves likely to fall prey to the aggressive ants. When Rettenmeyer returned to Kansas, faculty members were impressed. They urged him to apply for a grant to return to the rain forest and continue his research. Rettenmeyer received grants for three further trips to Panama—now with his new bride of a few months, Marian Wolf Rettenmeyer, an Ohio Wesleyan graduate he’d met while taking summer courses at the University of New Hampshire in 1951. “Marian had liked insects as a little girl and was actually interested in ants, so I knew she was a woman I had to keep track of,” he laughs. She became his lifelong partner and assistant. It’s also comforting to have a partner close by when you’re being jostled by a 200-pound tapir that—lured by your lunch bag—is going berserk because the ants you’re following are biting the soft skin between its toes. With grants from the NSF and, later, the University of Connecticut Research Foundation, he and Marian made more than 20 expeditions to Panama, Costa Rica, and Ecuador as well as field trips to Kansas and Texas, collecting specimens and studying the behavior of army ants. His early research is carefully recorded, neatly handwritten, on 3- by 5-inch index cards, which he keeps in his university laboratory along with the 600-page dissertation that resulted in his receiving a Ph.D. 1962. 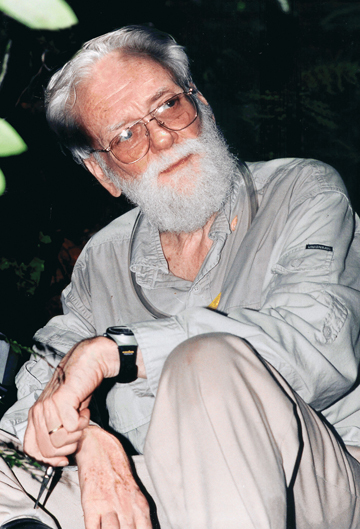 Rettenmeyer’s research led him to an assistant professorship at Kansas State University, visiting associate professorships at the Organization for Tropical Studies in Costa Rica, and, in 1971, a professorship in the Department of Ecology and Evolutionary Biology at the University of Connecticut–Storrs. He retired in 1996 and now holds emeritus status. Founding director of the Connecticut State Museum of Natural History, he is the author of many scholarly articles, monologues, and book chapters. His photographs have appeared in publications of wildlife organizations including National Geographic, the Audubon Encyclopedia of Wildlife, National Wildlife Federation, and Smithsonian magazine. In 1996, Rettenmeyer was diagnosed with Waldenstrom’s macroglobulinemia, a form of lymphoma. “I was supposed to die in 1997 or 1998,” he says, but a new drug developed around the time of his diagnosis has kept his disease in remission and allowed him to continue to work. “It was really a miracle.” He often uses a wheelchair to get around these days, yet, despite his frailty, he still visits his office several days each week to continue identifying the tens of thousands of insects he has stored in bottles and jars in a temperature-controlled section of the university’s Biology Department. Also housed there is the Rettenmeyer Collection, which contains hundreds of thousands of already identified specimens, preserved in layer upon layer of neatly ordered trays. 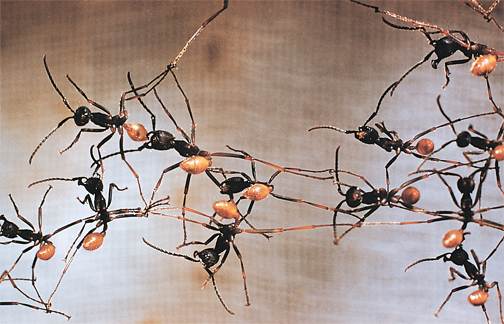 In 2006, Rettenmeyer published a DVD titled Astonishing Army Ants, a spectacular testament to the breadth of his research and the fascinating behavior of his subjects. He is currently working on a second film called The World’s Largest Animal Association, highlighting the 300-plus species that are completely dependent on army ant colonies for survival. And for those who watch them, those corny science-fiction movies will pale by comparison.